Remember the Generation Fresh program that I told you about a few weeks ago? Well, we had a lot of fun filming the recipe videos in Baltimore in the McCormick kitchens. As soon as our videos are finished being edited, we will share them with you! In the meantime, I’m still cooking a little bit in the kitchen with my Mom- mostly on the weekends since my weekdays are full of homework and sports. And I have a fun contest to share with you today. It involves Pinterest. Soooo I’ve been talking to my Mom about signing me up for a Pinterest account for MONTHS now… and I still don’t have one. But I’m going to assume that you do. See, Pinterest is a really cool website where you can keep all of these bulletin boards of things that you like- food, recipes, cars, sports, animals, vacation places, etc, etc. Every time you’re on a website that has something really interesting that you want to remember, you can PIN a photo with a link from that website to one of your Pinterest bulletin boards, and then you’ll have it there to find later if you want. 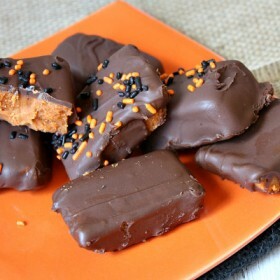 Everyone (except me, not yet) is on Pinterest- even the people at McCormick Spices! And they’re having a contest where you can win the items pictured below. 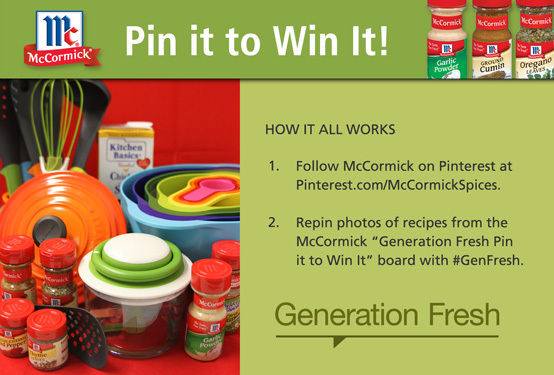 Just repin recipes from the McCormick Spice “Generation Fresh – Pin it to Win It!” board to one of your own Pinterest boards and include the hash tag #GenFresh in the description of the pin for a chance to win. You can only pin a photo from the Generation Fresh board once and that counts as one entry, but you can pin as many photos as you want for multiple entries- include that #GenFresh hash tag and you are entered to win! The contest runs through the end of October. 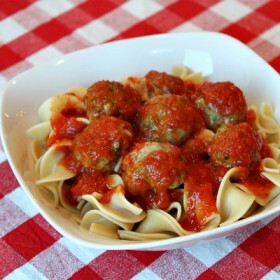 I am totally on pinterest!